In support of the OpenQuest Bundle of Holding that is currently running until Tuesday 4th April, here’s the third of a series of posts about how the OpenQuest module Life and Death was written. 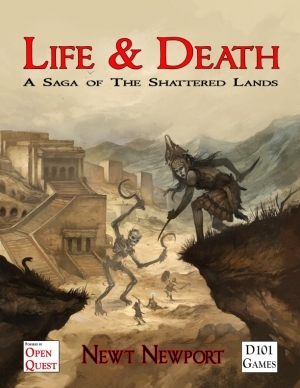 Life and Death had two very direct and primary design goals when I started writing it back in 2007. A desire to write and publish a RuneQuest adventure. I’ve been a RQ nut for years and with the release of the System’s Resource Document for the Mongoose version of RQ (aka MRQ SRD) and the maturing of the pdf/pod publishing model, that made it practical for one man creator outfits to publish stuff rather than risk thousands on the traiditional printing press model, put up the green light on that on. Disillusionment with Glorantha as a muse. I had been playing Glorantha for a good 25 solid by this time and I was sick of it. Sick of the constraining setting assumptions, sick of the self righteous fan boys I was meeting at cons (my primary outlet at that time) and just a whole hunk of jadedness that you naturally get after being a bit obsessed for a good quarter of a century. So I proceeded to stick my head down during my lunch hour at work and hammered the keyboard for a couple of years on and off, working out how to write a presentable setting/adventure pack as I did. These are the things I learnt on the way. I like my settings short sweet and flavoursome. The setting for L&D is 15 pages long and I have a general rule that the basic setting set up chapter (which explains the fundamentals and includes character generation an other rules changes) for OQ adventures should be no more than about 30 pages long. I’m a big Zombie film fan. Lots of the dead guys in the adventures, and the whole thing is a Fantasy Zombie Apocalypse. I like big themes in my adventures, even if they are off screen and the players don’t make much of it. In Life and Death the players are at the heart of a choice that could see the resurrection of their world, which is in a sort of undead state, or its final damnation. Now that’s something I have got from Gloranthan and hold to even in my smallest of D&D adventures. It is possible to write an D100 scenario without the temptation to write a big old railroady experience, that usually results in the rather linear “here’s a location stuff happens at it – then you go here and some more stuff happens – and finally you know to go here and have a big resolving confrontation (if you’ve been following the plot that the writer has laid down”)” way that some of the more poorly written D100 adventures adhere to. L&D death has a structure that while still making sense upon a simple read through allows the players to be at the heart of the adventure and make their own way through it while still allowing the GM to bring it to a dramatic and meaningful conclusion when it needs be. Figuring this out is what took the bulk of my development time and the thing Im happiest about (oh and the aforementioned Zombie Apocalyse). Because I was so intensely driven by L&D it was the second module that I released for OpenQuest and one I feel that has quietly slipped under the radar in many respects. So if you’ve not experienced its wonders, check it out in the OpenQuest Bundle of Holding, where its heavily discounted until Tuesday 4th April.